They may seem futuristic, but levitating Bluetooth speakers have been around for years, and look as outlandish as they sound. But LG is the first major electronics brand to throw a product in the ring, and is doing so with its classy-looking, albeit blandly named, “Levitating Portable Speaker,” which the company says it will be unveiling at CES in January. The plain, white somewhat egg-shaped speaker unit hovers over its round base, which LG calls the Levitation Station. The latter houses electromagnets that create the floating effect, and a subwoofer for deep bass. In addition to looking cool, the speaker also promises 360-degree sound and 10-hour battery life. It’s rated IPX7 for water resistance so you can listen to it outdoors, even if the heavens rain on your parade. When it runs out of juice, the floating unit automatically descends to the base station to recharge. Although LG’s Levitating Portable Speaker is not the first to market, its battery life and nondescript looks set it apart from its rivals. LG has not yet shared pricing information, but most other such devices cost in the range of $150 to $200, so the new speaker should cost about the higher end of that. We’ll likely find out more next month when LG shows off what this gadget can do. LG’s UltraFine 5K Display, designed in partnership with Apple, connects to the new 15-inch MacBook Pro with a single Thunderbolt 3 cable, which provides up to 85W of power to charge the notebook. The 27-inch IPS LED display has peak brightness of 500 nits and a wide DCI-P3 color gamut for more accurate and vivid colors. Apple has tacitly acknowledged that prospective MacBook Pro buyers remain skittish about having to buy dongles just to keep using their favorite peripherals. The company is extending its sale on USB-C and Thunderbolt 3 peripherals through March 31st, giving you another three months to pick up adapters and cables at a discount. As before, some of the bargains are better than others — the USB-C to USB-A adapter is down from $19 to $9, for instance, while SanDisk’s USB-C SD card reader is down from $49 to $29. This still won’t be completely satisfying if you absolutely need dongles to attach your devices (a USB-A adapter in MacBook boxes would be great, Apple), but there’s a bit less pressure to buy them before you’re ready. There’s also good news if you want one of Apple’s ultimate peripherals. It just started selling LG’s 27-inch UltraFine 5K display, making it under the wire for that promised December release window. The $974 display (normally $1,300) won’t ship for another 2 to 4 weeks if you didn’t order one right away, but the first customers should be getting theirs before 2016 is over. As with its smaller 4K sibling, the allure is routing everything through a single Thunderbolt 3 cable — you can charge your MacBook Pro and connect three USB-C devices without plugging in a rat’s nest of wires. It’s not quite as general-purpose as other 5K displays (it’s primarily intended for the Mac crowd), but its relatively low price makes it a deal compared to alternatives from the likes of Dell and HP. LG’s new UltraFine 5K Display is now available for purchase for $974 on Apple’s website in the United States, with orders initially estimated to ship in 3-5 business days but quickly slipping to 2-4 weeks. Apple has extended its $974 sale price for the display until March 31, 2017, when the price will return to $1,299.95. The discount was previously set to expire on December 31, but it was likely extended due to the display’s lack of availability until late into the month. Apple’s discount on USB-C adapters is similarly extended. LG’s smaller 21.5-inch UltraFine 4K Display began shipping in early November, while the 5K version briefly became available to purchase in late November. The display’s Thunderbolt 3 port enables pass-through charging to the new MacBook Pro at up to a full 85W. Its wide DCI-P3 color gamut shows more vibrant colors compared to the traditional sRGB standard. The display also has a built-in camera, microphone, stereo speakers, and three downstream USB-C ports at 5 Gbps speeds. LG’s UltraFine 5K Display is also available in Canada for $1,274, in Australia for $1,416.95, in the United Kingdom for £884, in Germany for €1,049, and elsewhere. Pricing and shipping dates vary. 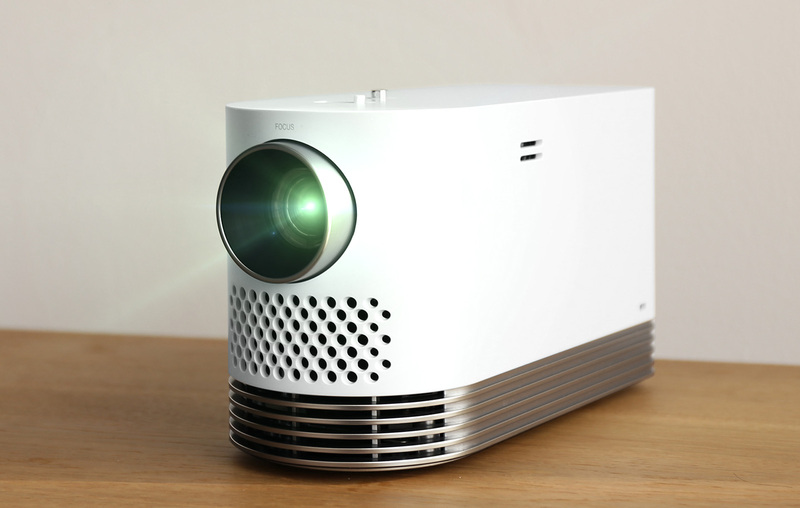 LG has unveiled a compact laser projector that, depending on the price, could appeal to a lot of folks. The LG ProBeam features 1080p (Full HD) resolution and 2,000 lumens of brightness, making it a viable home theater option. The laser system (LG didn’t say which kind, exactly) should provide a sharp, accurate picture, and nearly maintenance-free light source. At the same time, it weighs just 4.6 pounds and has a table-friendly form factor, making it portable and easy to use in small rooms. Furthering its appeal as a projector-on-the-go, the ProBeam can transmit audio to any Bluetooth speaker using its Sound Sync Adjustment tech, eliminating the need for any wiring. It also supports wireless mirroring via Miracast, letting you project a movie from your smartphone. That’ll make it much easier to set up in a small apartment, for instance, or let you “stream TV shows on a camping trip,” as LG puts it. To help you set things up quickly, the device has four corner and auto keystone features, in case your setup is off kilter from the projection wall. To make the ProBeam useful as a regular TV, it comes with LG’s webOS Smart TV platform and Magic remote, giving you easy access to Netflix, Amazon Prime Video or BBC’s iPlayer in the UK, to name a few services. It sounds like a nice option, but as I mentioned, all depends on the price — if it’s well under $1,000, it may end up being the hit that LG’s hoping for. Hopefully, we’ll get a look at it during CES 2017 starting January 3rd in Las Vegas, where it’ll be on display in LG’s booth. With an onslaught of products coming at CES 2017 in January, LG has decided to pre-announce its latest 4K HDR monitor. The 32-inch, IPS panel-equipped 32UD99 supports the HDR10 standard that delivers 10-bit (over a billion) colors and a wide color gamut covering 95 percent of the DCI-P3 standard. That, plus the True Color Pro settings, delivers “professional-grade picture quality” and “color reproduction accuracy unmatched in the industry,” LG says. Depending on the price, it will be a tempting option for graphics artists, video editors and colorists. LG also points out that the monitor will be ideal for new MacBook Pro owners, since Apple isn’t making its own displays anymore. It supports 4K HDR with a single USB-C cable that can simultaneously charge your laptop and can also act as a USB hub. (It likely comes with HDMI and DisplayPort inputs as well, though LG didn’t say.) The company is also targeting color-sensitive gamers, saying it’ll play well with new consoles that support HDR and or 4K, including the Playstation 4 Pro and the Xbox One S.
That said, the monitor is not really about sheer gaming performance. For the latter, LG will also show off the 34UC99, a 34-inch model with AMD FreeSync tech that eliminators judder and tearing, 1ms refresh times, dynamic action sync, and other gaming-oriented features. We’ll get a better look at both models in January, and hopefully learn the prices — if it’s low enough, the 32-inch model could sway a lot of folks looking for accurate color reproduction. At CES earlier this year, GM CEO Mary Barra announced, to much fanfare, that the Bolt EV would have a range of over 200 miles, cost less than $30,000 (after tax credits) and ship by the end of the year. So far, two of those three proclamations have come true. Fortunately for would-be owners, though, the automaker insists it’ll deliver on that last one too, promising that the car will begin shipping by the end of the month. Getting the Bolt out on the street isn’t just important for Chevy, but also for the future of motoring, and it’s all coming together in Detroit. Thanks to Tesla, most people associate car tech with Silicon Valley — not Detroit. And to be fair, most people would be right. Most major automakers have “innovation” centers just south of San Francisco, hoping to recruit from the area’s talent pool. But the most important feature of Bolt EV — an impressive range — didn’t happen in an office park wedged between two startups; it occurred in good ol’ Motor City. 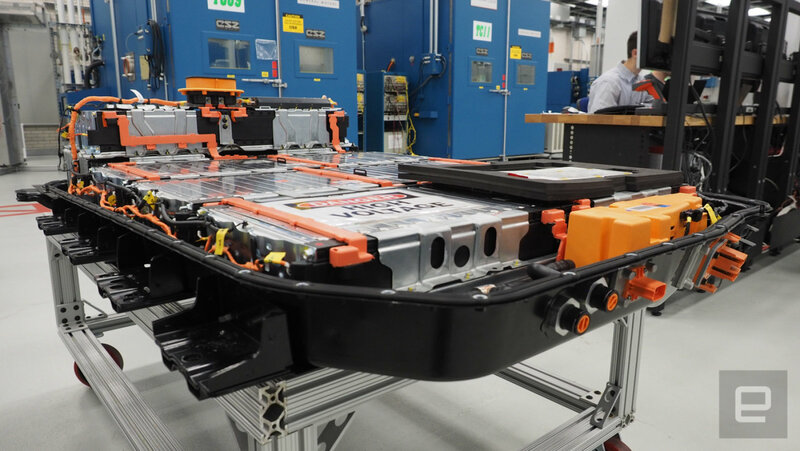 Nestled in the middle of its Warren Tech Center in Michigan, Doug Drauch, lead engineer for GM’s Global Battery Systems Lab, has been testing and fine-tuning power packs since the the company’s first foray into electric vehicles, the EV1. He feels the sort of excitement for battery chemistry and electronics that most people reserve for sports teams. Drauch and his fellow engineers have built a facility capable of testing battery packs in about 99 percent of the environments a car will encounter. While there are individual machines for environmental stress tests and power cycling, the main attraction is the “Shaker,” a giant machine that can re-create the X-,Y- and Z-axis vibrations of a vehicle driving on various types of roads. In addition, the company has built a custom chamber for the giant mechanical beast for environmental and power cycling trials. The machine is so well customized, GM could re-create the charge and power draw of a Bolt EV driving on a cobblestone road in a rainforest if it wanted. If that seems like overkill, bear in mind it’s part of a process that helped contribute to the car’s remarkable range. “Every time we run a test, we learn something new,” Drauch said. 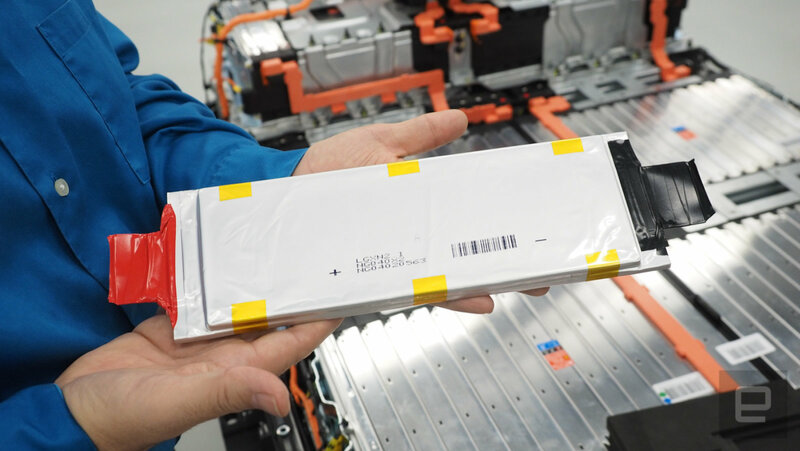 All those findings have helped the company create a battery pack with its partner LG that will push the Bolt to a 238-mile range. Right now its biggest competitor is the Tesla Model 3, which won’t be shipping until the end of 2017. 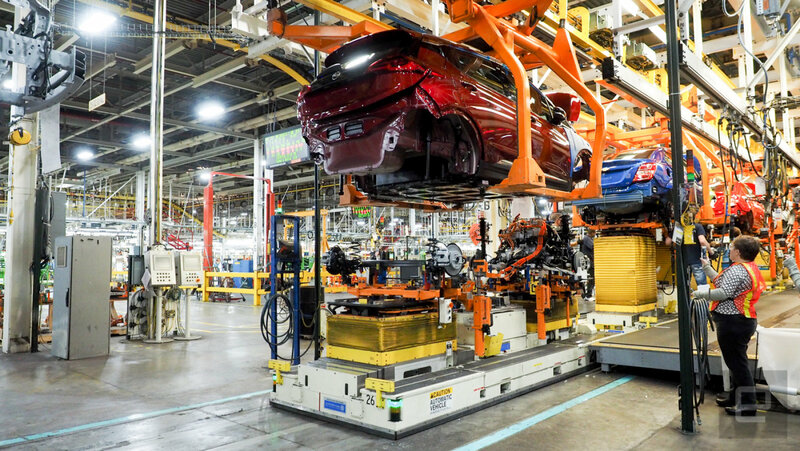 Of course, technology doesn’t mean anything if it’s not being implemented, and 25 miles down the road in Lake Orion, GM’s future is being put together. 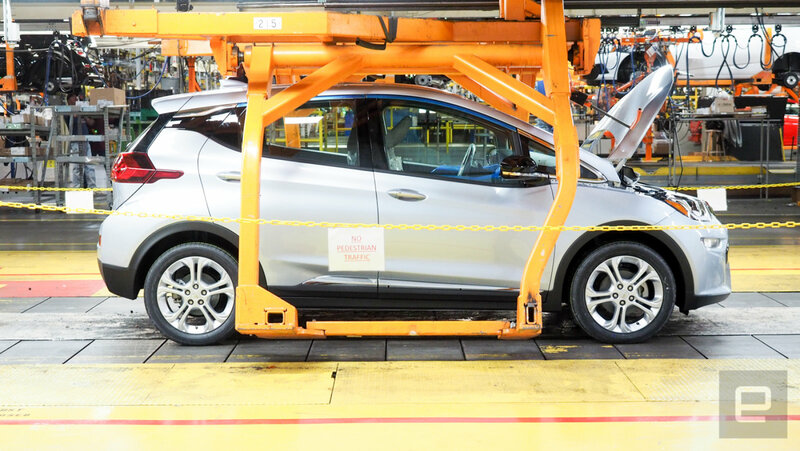 The Orion assembly plant is pumping out the Bolt EV for the US as well as for the European market (where it’s known as the Opel Ampera-e) in anticipation of deliveries later this month. It’s being built alongside the Sonic and Sonic four-door. In my tour of the facility, the thing that struck me most was how seamless adding the electric vehicle is. Alongside two gas-powered Sonics, assembly workers add the motors, battery pack and other parts to Bolts as they pass by. Autonomous sleds deliver the large essentials and lift them into place while the employees secure them. Bolt launch manager Yves Dontigny said that this system allows the company to ramp up production if needed. If the Bolt is a hit, the automaker can just add more of them to the line, instead of the current allotment of one EV for every two gas-powered cars. Even the spark-producing body shop built specifically for the car isn’t anything out of the ordinary. Dontigny said that the company creates one for every car it manufactures. But the Bolt isn’t like other cars. For one thing, it’s new from the ground up — not just in terms of design and technology, but in the way automakers bring a vehicle to market. The high-range EV went from design to introduction in three years. That’s a process that usually takes five years. And yet, because GM has been making cars for 108 years, even when it produces a high-range affordable car that beat Tesla to the market, inside the factory, at least, it feels like business as usual. As one of the Bolts ends its journey along the assembly line, it’s fired up, the wheels are attached and it’s lowered onto the ground. It’ll join a growing fleet of cars being prepped to land in showrooms before December comes to a close. Nearly a year ago, CEO Barra took to the CES stage to share GM’s vision of the future and made a pledge that the future would appear in 2016. The workers at Orion are making sure that promise is kept — now the company just needs to sell those cars. After a couple of rough quarters for its mobile phone division, LG announced today that it will promote Jo Seong-jin, the head of its profitable Home Appliance business, to the role of Vice Chairman and CEO of the company. While the company’s new flagship phone, the LG V20, appears to be selling well, the mobile division as a whole has been dragging the company down since Q3 2015 despite record numbers from the the home appliances division. Despite those losses, LG’s mobile division boss Juno Cho will have another opportunity to help his group bounce back from flops like the LG G5. Cho is keeping his position for now, but the South Korean company also promoted 57 other executives this week, compared to the 38 it promoted in last year’s yearly restructuring. Also worth noting: Mr. Jo only holds a high school diploma and no bachelor’s degree, but he’s been with the company since 1976 when he helped develop LF’s first automatic washing machine. (Earning him the nickname “Mr. Washing Machine” in the process.) Since taking over LG’s Home Appliance and Air Solution company in 2015, Jo helped roll out the high-end LG Signature brand which is responsible for smart home and IoT devices like this smart fridge with whopping 29-inch tablet built-in.